Sorry, but this isn’t going to be a post on how to set up the command line, so in the interest in getting the most out of this post, I’m going to assume that you are using the terminal if you are on a Mac or that you have installed Cygwin if you are on a Windows machine. Tip – If you get confused or want to clear the screen and start again you can just clear the screen using “ctrl+l”. Also if you run a command and it’s running for a long time, you can quit by pressing ctrl+c. This is handy to remember; it can be easy to get lost or forget which folder you are in so hitting pwd can be useful. “cd ..” – This would then take you to the folder above, which in this case is the desktop. Tip – When typing out a folder or file name, you don’t need to type the full thing, just press the tab key and the command line will auto complete as far as possible. In the case of the example above, we could just Type “cd F(tab)” and it would auto compete up to “Folder \” meaning we just need to add the 4. Now that we know the basics and how to get around in the command line environment, let’s get into something more interesting. Let’s look at how you can open, search, edit and export documents in seconds. As this is designed to be used by SEOs, the files that we are going to use are log files from my personal site. It’s a tiny site with very little traffic so the files won’t be too large, which is perfect for our needs. I’ve included 4 months of logs, from April to July. “ls” – List folder 1 items– There’s only one named Server Logs, let’s go into it. Let’s look inside the first log file. As you can see, it’s a long file name and it’s annoying to type out. This is where the tab trick comes in handy as we don’t need to type it all out. For this, we are going to use a new command named “cat” which means output or to make it easier, it basically means show me the file contents within the command line of the file I say . Let’s “cat” the first file in that list, the one that ends in 114.log. The output will be the contents of that log file and will look something like the image below (note I have chopped off some of the contents to make the content readable). What can we do with these log files? 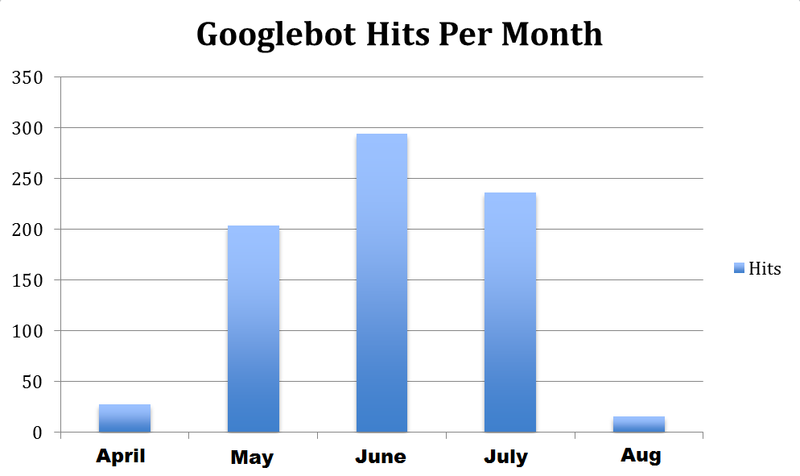 What if I wanted to find out how many times Googlebot visited my site in this month? For this I’m going to assume you know how to read your server logs. Here’s the thought process of what we need to do: (note I'm searching for "ooglebot" to avoid missing entries with or without a capital G"
Below are the individual steps to do all of the above; the numbers are consistent for ease of following along. “cat *\.log” – Note the backslash before the “.” – this escapes the full stop because there actually is a full stop in the file name. The output from this is all the server logs in April. The output of which will be three numbers; these correspond to the number of Lines, words and characters of the output as shown below. As you can see from above, that returned a count of 189 for the number of times Googlebot hit my site in April. match one or more patterns. wc – The wc command outputs the number of lines, words and characters in the document. 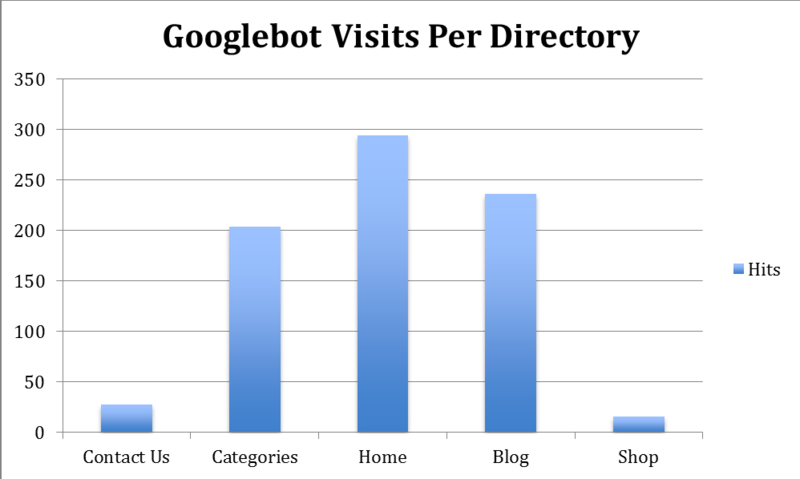 How often does Googlebot visit your most important pages? 108.162.226.47 - - [28/May/2012:23:44:40 -0700] "GET www.craigbradford.co.uk/category/seo/ HTTP/1.1" 200 3421 "-" "Mozilla/5.0 (iPhone; U; CPU iPhone OS 4_1 like Mac OS X; en-us) AppleWebKit/532.9 (KHTML, like Gecko) Version/4.0.5 Mobile/8B117 Safari/6531.22.7 (compatible; Googlebot-Mobile/2.1; +http://www.google.com/bot.html)"
108.162.226.47 - - [29/May/2012:01:59:32 -0700] "GET www.craigbradford.co.uk/robots.txt HTTP/1.0" 200 66 "-" "Mozilla/5.0 (compatible; Googlebot/2.1; +http://www.google.com/bot.html)"
108.162.226.47 - - [29/May/2012:13:30:41 -0700] "GET www.craigbradford.co.uk/robots.txt HTTP/1.0" 200 66 "-" "Mozilla/5.0 (compatible; Googlebot/2.1; +http://www.google.com/bot.html)"
108.162.226.47 - - [29/May/2012:13:30:47 -0700] "GET www.craigbradford.co.uk/index.php HTTP/1.1" 200 4945 "-" "DoCoMo/2.0 N905i(c100;TB;W24H16) (compatible; Googlebot-Mobile/2.1; +http://www.google.com/bot.html)"
I think that’s plenty for today, wouldn’t you agree? Just before I finish, think about how you could use the above process on a larger scale. 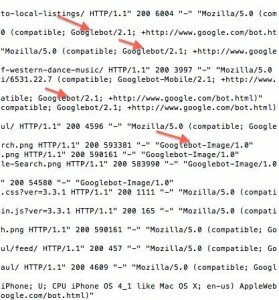 Obviously I’ve only used it for a few months and for all pages of my site, but what if you wanted to check if Googlebot wasn’t visiting certain pages or sections of your site as often as others? You could use the above process, but instead of pulling out months, you could pull out specific sections of a site and perhaps produce a graph like that below. You could plot the number of times Google has hit your blog, your shop etc over the space of 12 months. If there are important sections of your site not getting crawled as often as you would like, you could use this as a signal to perhaps revise your internal navigation or build more links to the important pages that make you money or drive conversions.